On a challenging and hilly course in the surrounds of Khao Yai National Park with increased elevation for all distances. The iconic 100km distance saw 287 runners on the startline for a 5am gun start. Thailand’s two-timer winner Sanya Khanchai did the early running but at the 36km mark was overtaken by David Emch (USA) who then set a blistering pace over the remainder of the course. Kristian Morgan (GBR) returned determine to beat his third place from last year, and over the second 50km loop took time out of the leaders finishing second overall, less than two minutes behind Emch whose final time was 09:46:37. Quang Tran (VNM), winner of the 2017 Vietnam Mountain Marathon (100km) rounded out the male podium with Khanchai having to settle for fourth. Carole Fuchs (FRA) lead from start to finish to dominate a women’s field packed with international talent and past champions, and smashed the course record by more than 40 minutes, finishing in a time of 10:21:58. Almost two hours back was new talent Wipawee Pratumsuwan (THA) who was racing her first ever 100km ultra. Kazumi Kawamoto (JPN) finished third. Petr Novotny (CZE) was running second to Edgar Puruganan (PHL) in the early stage of the men’s 75km race but after Split 2 found an extra gear to take the lead which he never gave-up, crossing the line first in 07:32:06. Keisuke Endo (JPN) finished second with Edgar Puruganan in third. Naomi Imaizumi (JPN) was back to defend her title and did so resoundingly with a finish time of 08:17:29. Two hours ahead of Kanokkorn Vitesakan (THA) and Kristi Wollbrink (USA) in third. John Ray Onifa (PHL) lead the 50km field from start to finish, crossing the line in a time of 04:01:50. Up against some top male ultra runners including Mount Kinabalu International Climbathon Race past winner Daved Simpat (MAS), who ultimately finished third behind Ivan Vlasenko (RUS) in second, Onifa’s win was all the more impressive. Despite a strong line-up, Thailand-based Polish ultra-runner, Monika Jablonska won the women’s 50km division by almost 25 minutes from Naomi Henshall (AUS) in second and Caroline Goransson (SWE) in third. The caliber of runners this year was higher than ever and with increased international participation a number of the top places went to overseas runners. However, in the 25km division it was Thai super-climber, Jantaraboon Kiangchaipaiphana, who revelled on the mountainous course and despite a niggling injury ran away with the title in a time of 01:58:25. Second place went to Juanico Coli Chepeda (IDN) with Thailand-based Blair McBride (CAN) in third. A close race in the women’s 25km saw a trio of Americans on the podium. Hannah Larson managed to stretch out a two minute lead and held on for the win in 02:25:38 ahead of Xiomara Templeton in second and Keesha Archard in third. Reza Rebuan (MAS) set a blistering pace over the tough 15km course finishing in 01:18:55 while Wasan Ratana-Aporn (THA) claimed second just 10 seconds ahead of Hong Kong’s Man Lit Ho. 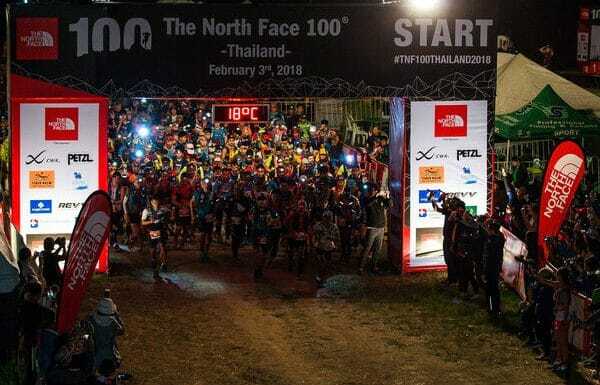 The North Face 100® Thailand attracts runners from around the world each year and has over the last seven years helped to put Thailand on the map as a top trail-running destination in Asia.